Innovative developments in science and technology require a thorough knowledge of applied mathematics, particularly in the field of differential equations and special functions. These are relevant in modeling and computing applications of electromagnetic theory and quantum theory, e.g. in photonics and nanotechnology. The problem of solving partial differential equations remains an important topic that is taught at both the undergraduate and graduate level. 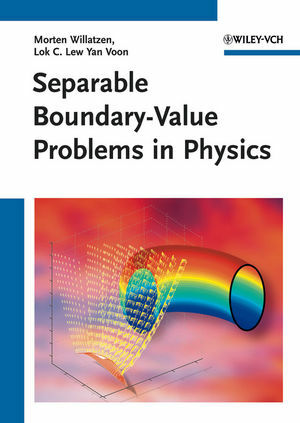 Separable Boundary-Value Problems in Physics is an accessible and comprehensive treatment of partial differential equations in mathematical physics in a variety of coordinate systems and geometry and their solutions, including a differential geometric formulation, using the method of separation of variables. With problems and modern examples from the fields of nano-technology and other areas of physics. The fluency of the text and the high quality of graphics make the topic easy accessible. The organization of the content by coordinate systems rather than by equation types is unique and offers an easy access. The authors consider recent research results which have led to a much increased pedagogical understanding of not just this topic but of many other related topics in mathematical physics, and which like the explicit discussion on differential geometry shows - yet have not been treated in the older texts. To the benefit of the reader, a summary presents a convenient overview on all special functions covered. Homework problems are included as well as numerical algorithms for computing special functions. Thus this book can serve as a reference text for advanced undergraduate students, as a textbook for graduate level courses, and as a self-study book and reference manual for physicists, theoretically oriented engineers and traditional mathematicians. Morten Willatzen is Head of Research at the Center for Product Innovation of the Mads Clausen Institute at the University of Southern Denmark. Having received his PhD from the Niels Bohr Institute at the University of Copenhagen, he held positions at Aarhus University, Max-Planck-Institute for Solid State Research, Germany, and Senior Scientist at Danfoss A/S, DK. In 2000 he became Associate Professor, in 2004 Full Professor at the University of Southern Denmark. Morten Willatzen's research interests include solid state physics, in particular quantum-confined structures and applications to semiconductor laser amplifiers, flow acoustics, and modelling of thermo-fluid systems. L. C. Lew Yan Voon is Professor and Chair of the Department of Physics at Wright State University. Educated in Cambridge, England, and Vancouver, Canada, he received his PhD from Worcester Polytechnic Institute, USA, where he held positions until 2004, with a stay at the Max-Planck-Institute for Solid State Research as an Alexander von Humboldt fellow. Dr. Lew Yan Voon was visiting scientist at the Air Force Research Laboratory, Hong Kong University of Science and Technology, Stanford University, and the University of Southern Denmark. Professor Lew Yan Voon received the Balslev Award (Denmark) and the NSF CAREER award. His research interests are in semiconductor theory and mathematical physics and involve the study of band structure theory and applications to nanostructures.